Museum APIs are an excellent resource for exploring information in collection records that public facing collection search interfaces (e.g., those found on most museum websites) do not provide access to. This project utilizes the Rijksmuseum API and the Getty Research Institute’s Union List of Artist Names Vocabulary (ULAN) to take a closer look at the museum’s collection of paintings from the Dutch Golden Age, which took place during the seventeenth century. The Rijksmuseum is located in Amsterdam and was founded on November 19, 1798. The museum has a long and storied history, and its expansive collection has grown strong in numerous areas, including its holdings of Dutch Golden Age paintings. I began my exploration of the records for these paintings by querying the “Collection” element of the museum’s API, which provides a broad view of the collection, but does not return detailed artwork information. I queried the Collection element with the goal of obtaining ID numbers for the paintings I was interested in studying. I used these ID numbers later to query the “Collection Details” element of the API. As the name suggests, this element provides more detailed information about artworks in the collection, but has fewer access points; if you want information from this element, it is best to have an ID number. 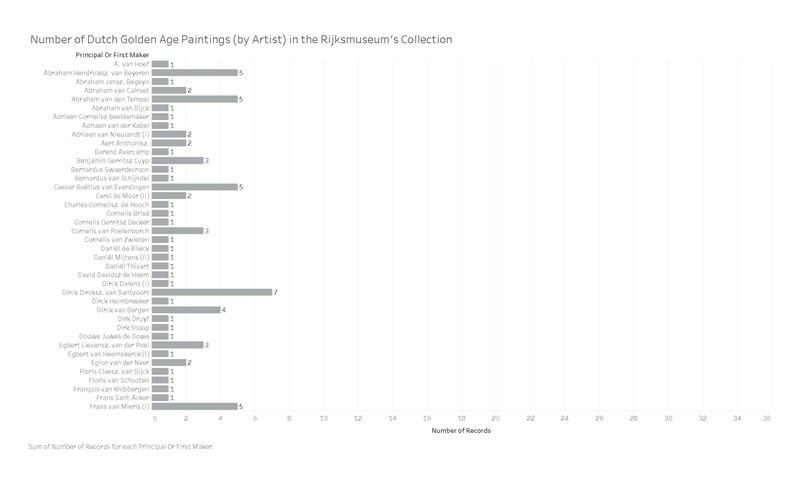 By limiting my query of the Collection element to “paintings” and “seventeenth century,” I was able to compile a list of ID numbers and artist names that pertained to artworks of the appropriate medium and time period. However, I still needed to do more work to ensure that the paintings listed reflected only those produced by Dutch artists. In order to do this, I checked the ID number/artist name list against the Getty’s ULAN Vocabulary. This resource provides detailed and internationally accepted standards for artist information. By contacting the Getty previously, I was able to download the entirety of the ULAN Vocabulary, which is comprised of four XML documents (the largest of which is roughly 1.5 gigabits) for local access. This resource was referenced throughout the data collection and analysis process for this project. 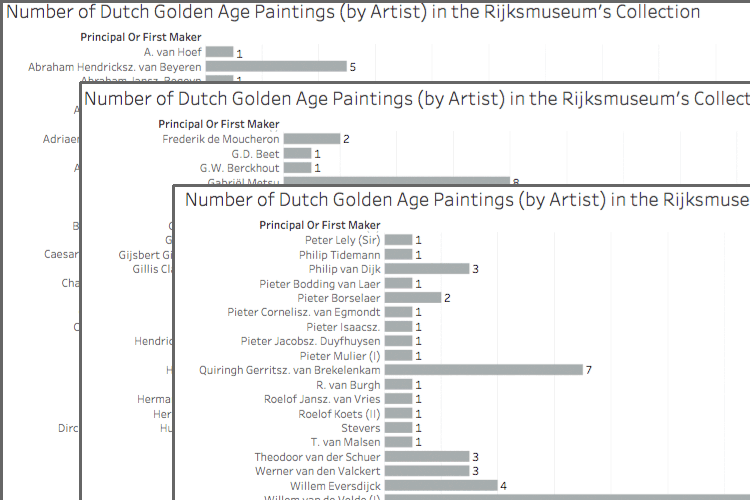 By programmatically comparing the list of ID numbers/artist names that I received from the museum’s API against the list of artists assigned the preferred nationality “Dutch” by the Getty, I was able to generate a list of potentially non-Dutch artists included in the list of seventeenth-century paintings returned by the museum’s API. A portion of this list was checked for false negatives (i.e., artists that were in fact Dutch according to the Getty but did not match the museum’s record because of slight differences in formatting). This list of roughly two hundred artist entries were changed by hand so that their records could be returned by the museum’s API (further corrections will continue in the future in order to enhance the quality of this dataset). The new list of confirmed Dutch artists was then used to generate a list of ID numbers that represented records of paintings produced by Dutch artists during the seventeenth century. This list was then passed to the Collection Details element of the API, which as previously noted, returns more detailed artwork information, including the title, medium, date of production, size, unique ID number, and URL of web accessible image (where available). I analyzed the records returned by the Collection Details element of the museum’s API using the data visualization software Tableau and produced the documents shown above. 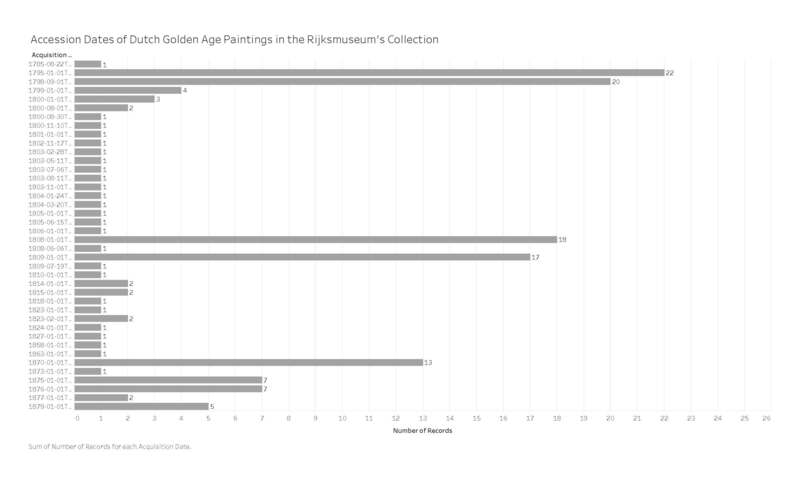 These documents revealed a number of interesting insights, such as which years have seen spikes in Dutch Golden Age painting accessions and which artists’ works are represented most heavily in the museum’s collection. If you’re interested, feel free to check out the code I used for this project on GitHub, which is linked here. Thanks very much for stopping by!